« Who will Win at the Victorian St Ayles Championships? The regatta season is about to begin, the “Monaco of Scottish Coastal Rowing” is back again this year for the 7th time. Boatie Blest will be hosting the short, oval course again this year where crews battle out to win in a pursuit around a tight harbor course. Races take approx 2 mins 30 to complete but in this time crews must start and complete not one but two 180 degree turns, and two “slight” long bends. The tight gap between the harbors test the coxswains and the rowers nerve: a rare race where the spectators can judge which crew is winning or loosing when the crew often cannot. 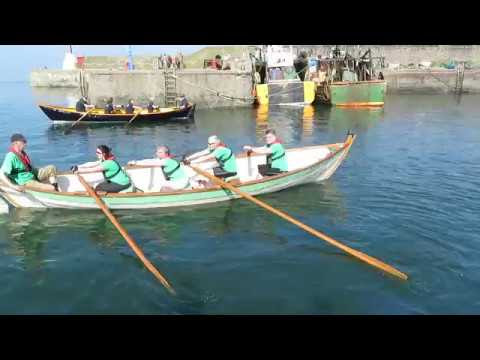 The races are an unusual format for Scottish Coastal Rowing as crews race head to head to progress, with wins in up to 3 rounds of racing needed if you are to be crowned the champions. A must see day out at Port Seton where there is guaranteed to be close racing, good spectating, lots of shouting and the occasional poor turn leading to an almost inevitable race defeat for some! Races kick off around 11am – with over 70 races planned to go ahead during the day it will be action packed and non-stop. The Boatie Bakers will be out in force again supplying the energy needed to keep the rowers and spectators going. Clubs wishing to attend can fill in the attached entry form and send to the email address provided. To wet the appetite below is a link to Youtube where Portobellos Intermediate crew demonstrate the course with some fine footage. This entry was posted on 27 February 2018, 12:08 pm and is filed under Uncategorized. You can follow any responses to this entry through RSS 2.0. Both comments and pings are currently closed.